The Highpoint Center for Printmaking announced it has completed its $3.5 million capital campaign to pay for its new building on Lake Street in Minneapolis. The HP2 campaign as it was know was launched in May 2008, with the new building renovated and opening celebrated by October 2009. 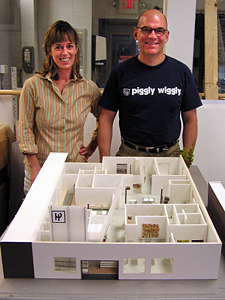 The actual fund-raising was completed in late December, but Highpoint directors Carla Magrath and Cole Rogers (shown left with an early model for the Center) released the news today. The new facility, planned by James Dayton Design is triple the size of the Center’s former home, and features much improved facilities including space for Highpoints artist cooperative, a studio for visiting artists to work with a Master Printer galleries, and a dedicated classroom for younger students.